October 29, 2010  Specialist Gerald Jenkins was killed by a roadside bomb near Kandahar, Afghanistan. The other day his fellow soldiers gathered there to remember him. October 29, 2010  Earlier this week, soldiers in Afghanistan held a memorial service for Specialist Gerald Jenkins. The 19-year-old died earlier this month when he stepped on a roadside bomb. 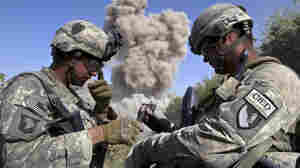 Earning Afghans' Trust The 'Big Challenge' For U.S.
October 28, 2010  Soldiers with the 101st Airborne Division in Afghanistan are trying to secure villages once occupied by the Taliban and laced with roadside bombs and booby-trapped buildings. Security is only half the battle, however, as many Afghan villagers are fearful of Taliban retaliation. October 25, 2010  In a major military offensive, thousands of U.S. and Afghan forces are sweeping through the rural areas north and west of Kandahar province. But they are finding few Taliban because they have either left the area or blended into the population. It may not be until next June before it's known whether the offensive was a success. 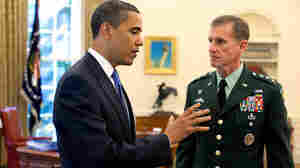 October 19, 2010  Gen. Stanley McChrystal's firing this summer prompted soul-searching within the military: Should top officers be political when talking publicly about issues ranging from Afghanistan to gays in the armed forces? There is no consensus. October 8, 2010  President Obama named Thomas Donilon as his new national security adviser today after Gen. James Jones quit the post. October 8, 2010  President Obama's National Security adviser, Gen. Jim Jones, is resigning and will be replaced by his deputy, Tom Donilon. Jones is the latest high-level aide to leave the White House. October 6, 2010  Staff Sgt. Robbie Miller loved the outdoors, Shakespeare and collecting gemstones from Afghanistan. That's where he was serving his second tour with the Green Berets. Miller was just 24 when he was killed in 2008, protecting his comrades from a Taliban ambush. At the White House Wednesday, President Obama will present Miller's parents with the nation's highest award for valor, the Medal of Honor. September 27, 2010  A hearing was held Monday in the case of one of five soldiers accused of murdering Afghan civilians. The Article 32 hearing, similar to a civilian grand jury, will determine whether there is enough evidence to go to trial. The soldiers are accused of murdering three Afghans over several months. There are apparently photographs that show the dead civilians, but military officials are restricting access to the pictures. September 22, 2010  A new book by Bob Woodward, called Obama's Wars, describes an elite, 3,000-member Afghan paramilitary group created by the CIA that conducts covert operations against Taliban havens on both sides of the Afghan-Pakistan border. September 16, 2010  The Log Cabin Republicans will ask a federal judge to order the Pentagon to stop enforcing the law barring gays from serving openly in the military. Last week, the judge ruled that the law violates the First and Fifth Amendments of the Constitution. September 14, 2010  The Obama administration is finalizing plans to sell $60 billion in fighter jets and helicopters to the Saudis over the next several years. The deal could change the military balance in the Middle East, and it also will help some balance sheets in the U.S. defense industry. September 7, 2010  There's a critical shortage of Afghan civil service workers in southern Afghanistan. 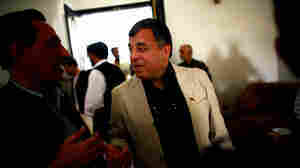 In dangerous regions such as Helmand and Kandahar, the insurgency has gained strength because the Afghan government is either corrupt -- or not around. September 3, 2010  The war in Iraq has entered a new phase, as U.S. forces move toward an advisory role. Among the legacies of the conflict is the effect it had on the U.S. military and the Army in particular. The years-long fight in Iraq strained the Army almost to the breaking point. The Army has also been forced to reinvent itself and is now fighting a brand of warfare -- counterinsurgency -- that it had been reluctant to embrace.